After putting in a couple of hours working on the mural at the Boatworks, I went inside for another two hours, trading my brushes for charcoal. The usual variety of short and long poses, the drawing above (about 25 minutes) was my best of the night. The model thought so as well, really liking what I did with the face. (she thought it had a Picasso feel- not my intention, but I can see where she's coming from) The model was good, so I collected her information for future use, thinking in particular of the figure class I've taught several times. I recognized the name immediately as a model who the department secretary had scheduled once a while back, but had cancelled in favor of a better paying job. Well, I'll hold on to her contact info anyway, you never know when it might prove useful. I received an e-mail from the new director of PCNJ today, with an attached copy of a letter that I guess I'll receive the old fashioned way soon. It was just to acknowledge my award from last year's annual Members Exhibition, although it added some important new information- the date of the exhibition that is my prize. The three award winners will share the Library Gallery during next year's Member's Exhibition, each of us getting a wall. I now know the start date- January 17, 2009. I don't know the ending date, so I don't yet know if this overlaps with my Rahway show. No problem if it does, but I do need to plan what works will be displayed at each location. More details as I know them. 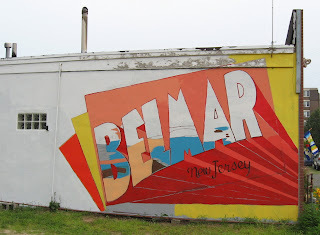 There's a new mural in progress over at the Boatworks in Belmar. 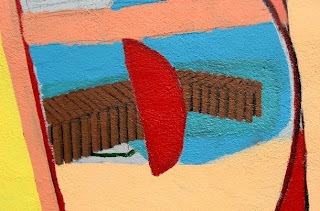 Last year we painted the large one on the south side of the building (that whole process is well documented on this blog in entries from July 17 through December 2, 2007- check the archives in the right side column); this year we tackle the north side. The design is one of those that was submitted last year. The process is being blogged in great detail over at the BAC blog for those who want to see it, from July 28 forward. My involvement started this evening when I joined a few other painters for a few hours. All the color seen was painted today, mostly during the morning session. My task of the evening was working on the wooden pier structure shown in the top detail, assigned to me since it was one of the things I dealt with last year. The wide view shows that my contribution is part of the letter B. The wood part is pretty much done, but the area around it (water, sand) has a long way to go. My work schedule means I won't be there every day, but I'll post something here everytime I am. I had errands taking me around the area today, but I eventually found my way to the Studio. 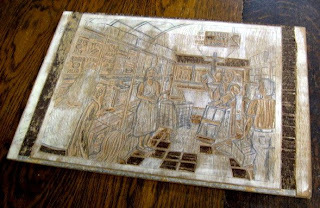 I finished cutting the area seen through the door, then took a pencil rubbing to see how it was looking. Good thing I did, because the results showed me a few things that needed a little more cutting. Once that was done I inked and printed two proofs, one of which is seen above. So far I like what I see. The area with the saint name may be a little confusing right now, but I figure that once the color is added the background shapes should separate from the rest of the text. The light/dark balance will work a little better as well. I'll let it dry a few days, maybe start the coloring on the weekend. When I got home from the Studio today I found a surprise in the mailbox. It was a thank you for Wednesday's talk at the OCAG in the form of a relief print/card from artist Elsa Herrmann, the person who set it up. For someone who is primarily a painter (watercolors), she has a nice reductive sense, breaking up the complex scene into the two tones, without losing detail or the sense of deep space. All in 4"x9". This afternoon I did a shift of gallery sitting at the Boatworks (the Food For Thought show that I'm in), and went up to the Studio afterwards. That left me only about an hour to work, but that was enough time to almost finish the St Leonard block. I did the rest of the lettering, the rest of the architecture, and the second protest sign. All that's left is to finish the area seen through the door- the rest of the soldier and the background. I'll finish that next time and maybe proof it in the same session. As part of tonight's demo, I continued cutting the new block. I finished the date at the top, more of lettering in the building signs, and some of the blank wall above the door. Not much, but it was enough to show everyone how the various tools work, and I was having to devote much of the time to answering questions. If I can get into the Studio this weekend, I should be able to finish it quickly. Tonight was my lecture and demonstration at the Ocean County Artists Guild in Island Heights. A year in the making, since it was last June that I was asked to do this. I spent last night putting together my slide presentation, a history of my art, mixed with some lessons on the history of relief printing. This afternoon I was busy getting everything else together. Forecasts were calling for major thunderstorms in the afternoon and evening, so even though it was bright sunshine when I left, everything was weatherproofed. The website directions were fine and I got there about 10 minutes earlier than planned, but luckily someone was there to let me in. The Guild is in a restored Victorian, much larger inside than I expected. 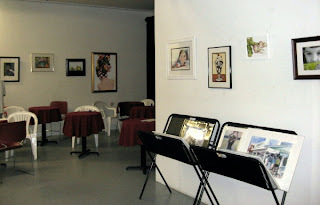 There are gallery spaces in two front rooms, and more work hung in a large room where I was to set up. A few trips got all my stuff inside, and I had more than enough time to set up. I started with the slides, projected against a blank wall. Next was the demo, on the table shown above. 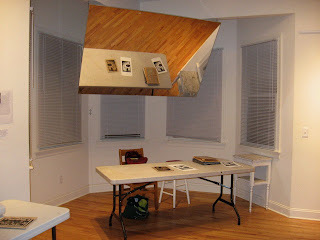 It has a mirror set up overhead, to allow the audience to get a view of what artists are doing on the table. In my case, everyone moved their chairs up really close to the table, so they could probably see it directly. I did a little more work on the current block, showing how I use all my tools. 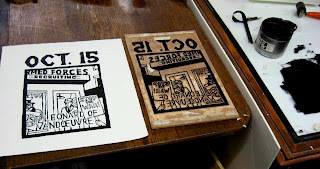 Then I printed an older block, so they can see inking and hand printing in action. I also showed some actual prints, including one of my large pieces and the block it came from. I answered many questions, but that's expected. The audience was small (about a dozen), but they seemed to be into what I was doing. A few even mentioned a desire to try it themselves, which always makes me happy. The demo took us right up to 9 pm. I packed up my stuff and got it out to the car in a few trips. (lots of distant lightning, but the rain never came) I left them the still wet proof I pulled during the printing demo (they'll likely use it at a fundraiser), collected my speaking fee, and got on the road home. Back to the Studio today to continue work on the new Leonard block. The idea is to show everybody at the OCAG a block in progress, and continue the process, showing how to use a variety of tools. This piece of wood is cutting easy- I got half the block cut in about 2 hours. I could have polished off the whole thing in the afternoon, but I wanted to leave some for tomorrow night's presentation. A quick rubbing showed that the tricky area where the Uncle Sam poster, protest sign, and saint name all overlap turned out fine, though the color will help clarify things in the final print. I made a brief stop at the Studio after work today and continued working on my latest block. Since last time I had done a little online research for images, and I put that to use today. On the right side of the block I put in part of the famous Uncle Sam (I Want You) poster by J.M. Flagg, though I rearranged the elements a little to work with the rest of the composition, and much of it is covered by a protest sign. What is visible should be enough for viewers to recognize the iconic image. In the doorway I put a more detailed version of the soldier I had earlier. I'll probably redraw the flag behind him. One other change is in the protest sign on the left. Originally I had a common slogan from recent years ("No Blood 4 Oil"), but I decided I wanted to make this a more general protest, not specific to our current war. Since much of the architecture in the sketch is based on the 1960's version of the station, I went for a more generic message that would apply then as now. Before finishing, I pencilled in some of the darks, more as a service to those who will be seeing me work on it at the demo in a few days. Tomorrow I plan to partially cut it, getting it started so that the people can see the block in process. 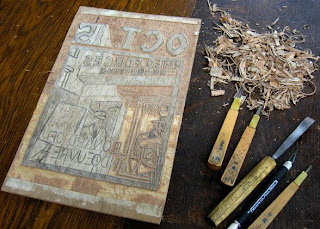 As I mentioned in the last post, I will be doing a lecture and demonstration of woodcut next week at the Ocean County Artists Guild. When doing some kind of public event, I prefer to have an actual project to work on, rather than just a scrap of wood. So that means getting something going right now. The easiest thing was to get another saint print started. When searching for information on another saint last year, I ran across the biography of St Leonard of Vandoeuvre. He was a 6th century abbot, who was known to encourage people to give up their property and leave the service of the king, including military service. Despite this, the king eventually became a patron of his abbey. Back in mid 1990's when I started this series, the story wouldn't have struck a chord (and it didn't, since I ignored it then), but several years into a much debated and protested series of wars in the middle east, with the military struggling to meet enlistment quotas, the story seems a bit more relevant now. 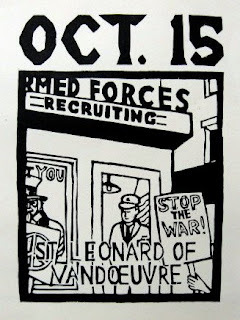 The idea I came up with is a military recruitment office with anti-war protesters outside. 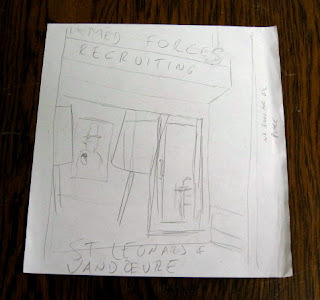 The one recruiting station that I know of in my area is a nondescript storefront in Bradley Beach, not particularly inspiring. More recently I thought of a more famous station, the one that's been in Times Square for decades. 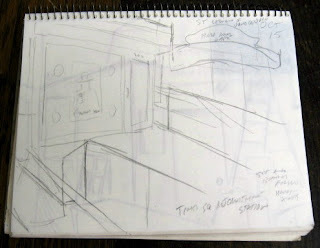 Too bad I didn't think of it earlier, because I was in Times Square back in April and could have done some sketches. I went to the internet and found various photos, which were the basis for the first drawing above. I also remembered a book I have with a photo from the late 60's, which showed the station as it looked then. I combined elements of both into a later sketch (2nd photo), which I liked well enough to base the final version on. 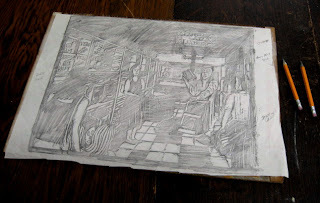 Today I was in the Studio, translating the earlier efforts into a block sketch, which can be seen above. This is not quite finished, but pretty close. I need to work out what's seen through the door (a soldier, etc), and the Uncle Sam poster on the right side of the block. The rest is pretty much done. 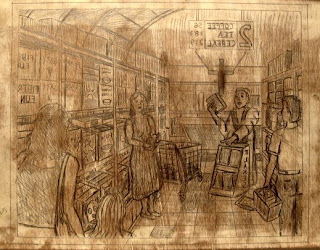 Over the next few days I need to finish the drawing, and start the cutting- finish the outline and date, maybe get to some of the interior. 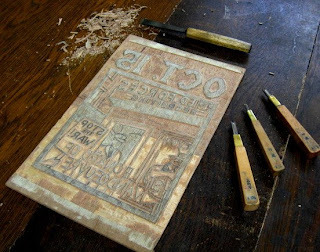 I'll be presenting my work, and a demonstration of wood block cutting and printing at the Ocean County Artists Guild on Wednesday, July 23, 7 to 9 pm. The Guild is located in a nicely restored 19th century house in Island Heights, NJ. There is gallery space, and they run a lot of classes and workshops. Once a month they have a public demonstration of art, and that's where I come in. I was recruited for this and scheduled more than a year ago, and now it's a few days away. 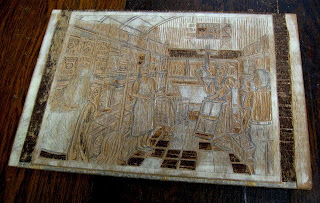 I will show some slides to give brief overviews of the history of woodcut and my own art, display some completed work, and do a demonstration of block cutting and printing. All this for free. We had the latest edition of the Belmar Critique Group tonight. Only 3 of us showed. The other two artist both brought works that were not quite done, each seeking opinions as to how to resolve the works. Both seemed happy with the suggestions. I brought my just finished supermarket print, so I wasn't looking to change any part of it. Not that they had any suggestions for improving it, but one suggestion was to make sure the full story (which I told them) was known. When I put a single supermarket print in a juried/group show, I'll include the story with the artist statement, but when I show a large group of them, I just give a general statement about the whole series. I don't have a problem with telling people the stories behind them (it's all on the blog after all), but I think there's something to be said for letting the viewer come up with their own stories for all the things I show. I think it makes their involvement more active, helps them form a more personal connection with the print. The same goes for most of my other prints, especially the large format ones of recent years. I can tell people all the stories, but it's also fun to see the viewers discover the little narratives and come up with their own interpretations. Another suggestion was to publish them in book form. It's a great idea, but I will probably need to be a lot more famous before a publisher is willing to front that expense. After the group was done, I went to the back room and caught the end of a trustees/coordinators meeting. It seems I am now a coordinator, thanks to the blog I'm doing for the BAC. It doesn't change things too much- I still do the blog as always, but now I go to a monthly meeting to talk to others about it. After work today I had plans to meet with Steve McKenzie in the Studio. I know Steve through the Printmaking Council of New Jersey, where like me he is an active member and part of the advisory board. He contacted me a few weeks ago to see if I was interested in being part of a group show that he's curating, and a few days later we picked the day for his visit. Coming down the Parkway South at rush hour poses some challenges, but he found his way to Ocean Grove, and to the basement. 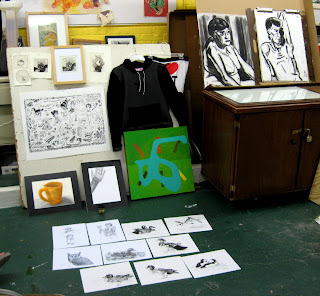 He had mentioned that he wanted to see some work from the past few years, so I had brought a variety of such prints with me, in addition to what I had hanging up in the Studio. He was impressed with my large pieces, the three 24"x36" prints. I showed him the new supermaket print, which he really enjoyed, so I went through the rest of the supermarket series with him. I also showed Steve a variety of individual medium and small works from the past few years. He decided that what he'd like for the show is the 3 large pieces, and 6 of the supermaket prints, which wil be hung in small groupings, if he can figure out how. 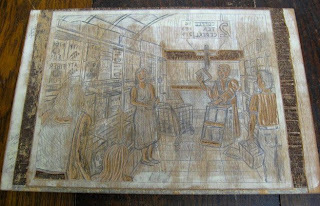 Meanwhile, Molly had put out a large variety of her work, all kinds, but with an emphasis on her relief work. 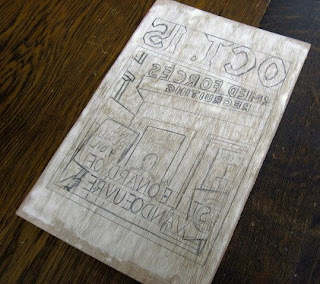 This included a new large block, but to this point it's just a sketch on the board. Steve picked out 5 pieces of hers that he'd like to have in the show. He's got a short list of other relief printers to talk to, looking to have about 10 artists in the exhibition. 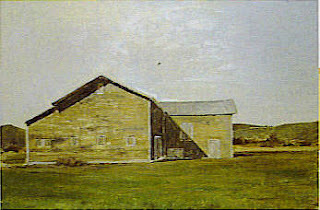 The exhibition is scheduled to be at the Arts Guild of Rahway, March 20 to April 10, 2009. It's a nice space, the large front lobby of a older building with interesting architecture, the town's former library, built in 1869. 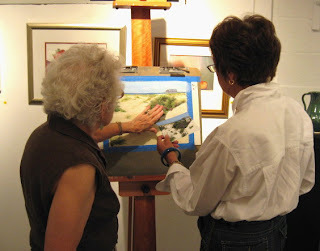 In addition to art exhibitions, they have art classes for all levels, and a jazz series, as well as other arts related programs. I saw an exhibition there a few years ago, a group show involving some other printmakers I knew, and thought it would be a good place to show my work. Unfortunately, they don't do solo shows, only groups, and I haven't had the time or energy to put together a group and proposal. This will get me into the space. 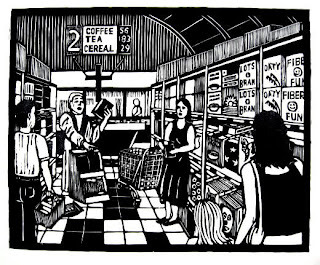 Today I went up to the Studio and finished the latest supermarket block. I made a few small cuts to the shopping cart, then started inking and printing. I pulled two proofs, both essentially identical. The results are shown above. It turned out pretty much as I expected, so I'm happy. The print is officially titled Scenes from the Grand Opening #21. With this one done, I'll begin a new project this coming week. Today was the opening reception for the Food For Thought exhibition at the Boatworks. 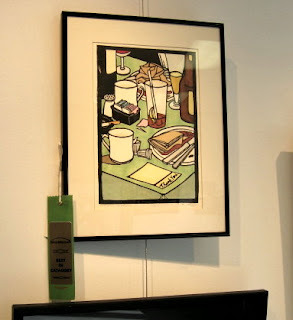 A nice surprise for me- I won a prize for Best in Category, for the category of Drawings/Graphics/Printmaking. (there may have been only one other person in the category, but a win is a win) My second piece was hung in the back, a Salon Des Refuses of work submitted to the main show in the front room. We had a decent turnout, at least 50 to 60 people during the time I was there. The show is open Thursday to Sunday, 1 to 5 pm, through August 2. After work this afternoon I drove over to the Studio and continued work on the latest block. I finished the cereal boxes and coffee cans, the ceiling, and some other odds and ends. 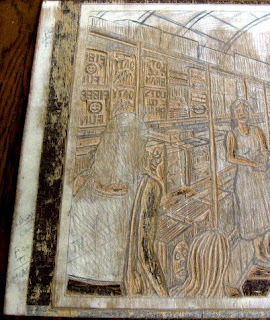 I took a pencil rubbing off the block with newsprint (top photo) to check the overall value balance and to see if I missed any spots. Having done so, I found a few things that needed fixing (mostly a few lines that clarified some of the black shapes) and took care of them. Also, I had left the semi-circular back wall as black, but after looking at the rubbing, I decided to cut it as a gray tone. I think it's just about done, though I may do a little more with the shopping cart before I print it. Earlier tonight I watched the debut of a documentary on HBO called "The Art of Failure: Chuck Connelly Not For Sale". Until I read an article about the film a few days ago, I had not heard of Connelly, but perhaps I should have. It seems he was part of the 1980's art star crowd, a neo-expressionist who sold over a million dollars worth of paintings in that decade (including a piece to the Metropolitan Museum of Art), and the model for the Nick Nolte character in the film New York Stories. But the guy had big issues- huge ego, alcoholism, generally obnoxious behavior. His last major show (at the time of the filming) was in 1990. Over the course of the film we see him alienate his only patron and drive his wife to divorce. An artist whose work once brought in 5 figures now sees his work selling in an online auction for several hundred- and he's not happy about it. No major gallery will talk to him. At one point he resurrects an alter ego from his school days and hires an actor to portray the fictional artist, in an effort to sell his paintings. It's only mildly successful. I decided to watch the film to get an idea of what life will be like when I'm a formerly famous washed up artist. 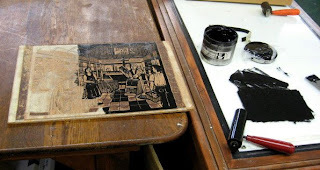 Just kidding- printmakers never get to be famous art stars in the first place. Most of the film shows Connelly drunk and belligerent- he admits it's not that uncommon a state for him, though the editing of the film may emphasize those moments. We also get to see dozens of his paintings. I can't say I like all of them, but it's clear that he's a very good painter, back in his 80's heyday and now. (plenty of examples can be found on the web if you look around) Other than the self destructive behavior, one thing shown is the dependence that a professional artist has on others to make a living. And those others- galleries, patrons, collectors- often have agendas of their own. But it isn't all bad. 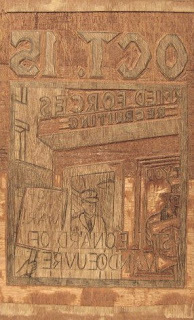 Thanks to the documentary, there is some renewed interest in Connolly's work, resulting in some current shows of his work. One hopes that the artist takes advantage of the opportunity to get his life and career in order, but I have my doubts. Up to the Studio for a few hours in the afternoon. Molly was already there working. Today was the official reception for Jill Kerwick's show in Asbury, and since Molly hadn't seen it yet, she wanted to go and I tagged along. Jill had a nice crowd, filling the small space. We walked back and continued working. For me, that was the current supermarket block. I did the overhead aisle sign, then dealt with the cereal boxes on the far left side. 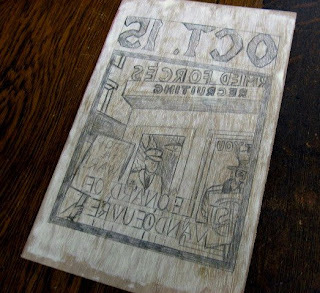 Lots of detailed cutting- lettering and a few images, exacting, slow work. (second photo shows detail of this section) Most of the remaining boxes are just solid tones (white/black/gray), so what remains should be finished on my next visit. Got back to the Studio this afternoon for a few hours. When I started today, the block looked like it did in the top photo, where I left off on Wednesday before the critique group. With the smaller blocks I tend to do all the white masses first, allowing me to see how the black/white breakdown is working. That started on Wednesday, and by today I was finished with the figures, floor, shelves, deep background, and some of the architecture- basically everything except those items involving text (sign, cereal boxes). My plan is to get to those latter items next (tomorrow I hope), and then deal with the gray tones. 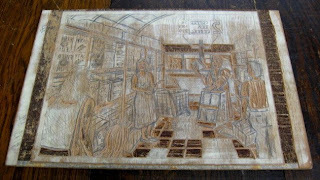 Got a phone call this afternoon from a printmaker I know through the Printmaking Council of New Jersey. It seems that he's curating a group show of relief printing at a space up in North Jersey, and he'd like to have me be a part of it. Sounds good. The plan is that he wants to come down to the Studio in a few weeks and look at some recent work. I'll hold off on the rest of the details until after that, except to say that this show would be in March/April 2009. I got to the Studio in the late afternoon, prepared some refreshments, and did a little preliminary cutting on the new supermarket block. Did the outline first, and few pieces of white areas within. (I don't have a photo, but will try to post one later) At 7 pm I was a little concerned because no one had showed up for our monthly critique/discussion group, but within a few minutes Molly and Tim (one of our regulars) arrived. It looked like that was it, but just after we got started, two of Molly's former students arrived to bring the group to 5 members, plus one non-artist friend. The top photo shows the work from the whole group, the second featuring some custom made clothing items and the artist who created them. Since I didn't have any new prints ready since last month, I decided to show some of the recent charcoal drawings. 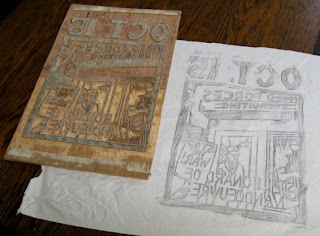 This was a big surprise for Molly, who had never seen anything other than woodcut prints from me before. As always we had a lot of good discussions going over the course of the 3 hours. (we tried to keep it to 2 hours, but it always seems to go longer, because we're having too much fun) The next group meeting will be Wedneday, August 6, at 7 pm. I was out riding around today on my day off, and one place I stopped was to check out a show of paintings by Guido Guazzoni. Guido is a regular around the Belmar Arts Council, as well as at the discussion group that they're holding at the Boatworks. In fact, you can see a photo of some of the discussion group members considering one of his paintings right here. That painting, as well as the one above, are on display at the Terner House Gallery, 701 Deal Road in Ocean Township, NJ, through July 31. To learn more about the artist, check out his website. From there I dropped by the Studio to continue work on the latest block. The results of that can be seen in the top photo. I fixed a few minor things, but mostly it was filling in details, such as designs on most of the cereal boxes and coffee cans, and adding darks throughout the image. I think it's pretty much done. Maybe I'll start cutting it before the group critique that happens in our Studio tomorrow night.